One reason we might not recognize that quitting is our wisest option is because we lack discernment. It’s easy to get trapped in all-or-nothing thinking. If we defy family in pursuit of our dream and something stops working properly—out of pride—often we’ll persist even when the very thing we’re attempting is the largest reason we will fail. We keep reworking that first novel over and over. We keep querying the first novel and won’t move on until we get an agent. We keep writing in the same genre even though it might not be the best fit for our voice. We keep marketing the first self-published book and don’t move forward and keep writing more books and better books. For the entrepreneurs (and being a creative professional falls under entrepreneurship), we can start throwing good money after bad. We started with an idea and, instead of hot-washing our results and being brutally honest? We (mistakenly) believe more money will fix a flawed plan. If you are tangled in a book that isn’t working, never ends, keeps getting rejected, ask for help. Sometimes the story (plot) is there only we can’t see it. We’re too vested and emotionally blinded. The act of never giving up is noble, but never giving up on the wrong things is a formula to fail. We have to learn to detect the difference between quitting a tactic and quitting a dream. If I’m trying to climb Mt. Everest, but I’m repeatedly failing at climbing the one side, which is a sheer rock face with no way to get a footing, then it is suicide to keep trying the same thing. If, however, I regroup, hike back to the bottom (hire some experts, a.k.a. sherpas), and take another way up the mountain, I am a quitter…but I am NOT a failure. Most of us are lousy at knowing how and when to quit. This is one of the reasons it is a good idea to surround ourselves with successful people, because successful people are expert quitters. ***Even if “surrounding” means following on social media, reading their books, listening to podcasts, etc. Just read Daymond John’s The Power of Broke, mega-blogger Jenny Lawson’s memoir Let’s Pretend This Never Happened, bazillionaire Mark Cuban’s How to Win at the Sport of Business: If I Can Do It You Can Do It, comedian Kevin Hart’s memoir I Can’t Make This Up and you’ll see what I am talking about. This list is filled with men, women, entertainers, entrepreneurs, and business tycoons yet they all began small and experimented. With time and experience they learned when quitting was the only way to make it to the next level. For instance, if business mogul and Shark Tank celebrity Daymond John had kept his ‘taxi’ business we might never have even heard of him. For those who don’t know, Daymond John got his start with a small scale fashion business (that we now know as FUBU) that he ran out of a large van. Being business savvy, though, Daymond John got as much bang for the buck with that van as possible. So, when he wasn’t delivering and selling fashion, he made additional money shuttling people from their bus stops to their doorsteps for a small fee. NYC, however, caught on—namely from all the complaints from taxi companies—and the city started ticketing him to the point that the great idea was a no-go. Again, fabulous concept—OBVIOUSLY since Uber eventually came along and did the EXACT same thing. But for Daymond John, it was a fabulous concept that could only work short-term to get him to the next level on a totally different playing field. For him it was a means to an end not the end (as was the eventually the case for Uber). When I started out, I had all the wrong mentors. I had writer pals who quit writing when it was boring or who quit querying after a handful of rejections. They quit attending critique because they got their feelings hurt when people didn’t rave their book was the best thing since kitten calendars. All this wrong kind of quitting is easy to fall into. Excuses are free, but they cost us everything. For me, I stalked people I admired on social media. I read a lot of books, memoirs, self-help, business books from people I admired. I had to change my thinking and, to do this, I had to immerse myself with people who had what I wanted. It was crucial to adopt their thinking, attitudes, and, ideally, benefit from their wisdom. A good example of savvy quitting? I turned in a hundred page proposal for Rise of the Machines—Human Authors in a Digital World in the winter of 2011 to a premiere agent, a DREAM agent. But, after NYC passing on it for over a year? I thanked my agent for his efforts, then went ahead and published it myself. 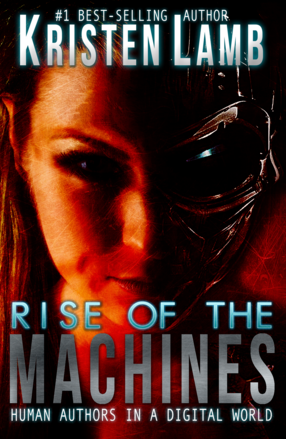 Yes, I self-published Rise of the Machines in 2012. Wasn’t in my plans, and yet…. My book remains a top social media branding resource because I chose to focus on humans and not technology. Technology changes, people don’t. When we understand what people like, hate, what makes them loyal, why they bond or flee, then it doesn’t matter whether we are using Instagram, SnapChat or any other platform. Because we know what makes our potential audience/fans/customers excited, we have an edge. We need to always be moving forward, and sometimes pressing on requires letting go. We can’t grab hold of the new if we are hanging on to the old. If I’d remained entrenched in my old circle of peers, that book would have never seen the light of day. And sure, letting go of a NYC deal sucked. What author doesn’t want a contract with major house? It was heartbreaking for me to walk away from the ‘hope’ that maybe NY would one day see the value of my book. Yet? It had to happen. The NYC plan was a a no-go and it came time to do something different. I wasn’t quitting my dream (publishing an evergreen social media guide), I simply was quitting my approach. If something isn’t working QUIT. Move on! If we have to defend and justify what we are doing there’s something wrong. It’s hard to know when to quit. I’m a loyal person. I’m loyal to a fault and I struggle every day with this lesson. But I’ve recently come to a conclusion. People who reach their dreams don’t get there by doing EVERYTHING. Everything is dead weight. Everything will keep us from focusing. Everything gets us distracted. Sometimes we need to let go of inefficiencies or false trails, and if we don’t let go, then failure is just a matter of time. Quit your day job. Today. This moment. Now, by quitting, I don’t mean you should throw your laptop in a waste can and take a bat to that copy machine that’s eaten every presentation you’ve tried to photocopy since the day you were hired….though that might be fun. No, I mean mentally QUIT, then hire yourself to the dream. Screw aspiring. Aspiring is for the amateurs and wannabes. It takes guts to be an author. It takes guts to be any kind of creative professional. Hire yourself to the job you dream about. TODAY. No aspiring writers, only pre-published writers. If you want to be a professional author, you must quit to win. The day job is no longer the ends, but rather the means. The day job is just venture capital funding the successful art-making business…YOU. You are a pre-published author…who happens to also be a stay-at-home-mom, a computer programmer, a salesperson, a whatever. Again, Everything is the enemy. Friends and family will want you to keep being the maid and the taxi and the babysitter and the buddy who can spend all day shoe-shopping. Many of us will try to keep being Everything to everyone and we’ll just try to “fit in” writing, but that is the lie that will kill the dream. We can’t be Everything! I can be respected or popular. I can’t be both. We must learn when to quit and to be firm in quitting. Others have the right to be disappointed, but they’ll get over it. And, if they really love us they will get over it quickly and be happy for our resolve to reach our dreams. If they don’t? They’re dead weight and it’s better to cull them out of our life sooner than later. Yes, this is hard stuff. Reaching our dreams is simple, but it will never be easy ;). So what are some of your quitting stories? Did it work? Were you better off? Tell us your quit to win story! Do you need help sticking to your guns? Hey, your family doesn’t get you, but we do! Do you have a problem and you don’t know if you should stick or quit? Put it in the comments section and let us play armchair psychiatrist!